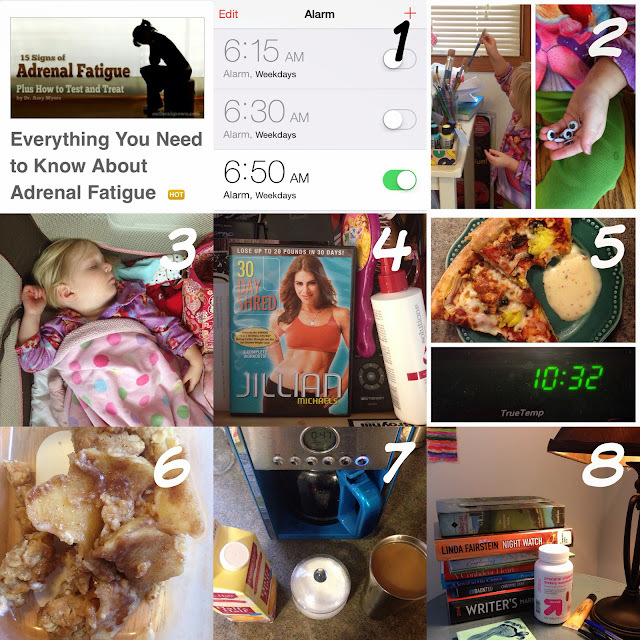 I read this article today about Adrenal Fatigue. I don't know why I continue to click on and read such articles. I must have a death-by-health-anxiety wish or something. I probably fell asleep around midnight and my alarm went off before 7am, as usual. Maybe if I let Common Core help me with math I could somehow get that to equal 8 hours. I say NO a million times a day, often in conjunction with "I've had ENOUGH! ", thus signifying that I've indeed reached my limit. I don't find that it helps. 3. Do something relaxing every day (warm bath, walk in the park, etc.). I'd like you to introduce you to my Jillian Michaels workout DVD. We have a complicated relationship. I got it about two years ago in January when I decided I needed to start working out. It remained in a drawer with the cellophane wrapper intact for about a year. I then decided I really should start working out, so I took the wrapper off. Now another year has passed, and although I've never actually even watched the DVD, let alone exercised to it, the disc is somehow missing. Maybe my wobbly bits and I will finally start working out when I find it. Yep, I'm sure we will. Pepperoni and sausage at 10:32am. Check. I heard fruit and butter. Apple crisp = consuming fruit with butter. Check. 7. Avoid alcohol, sugar, gluten and dairy (toxic and inflammatory foods). The only way I can drink this sweet nectar of sanity is to add the aforementioned sugar and dairy, so they will have to pry it from my cold, dead fingers when I die of adrenal failure. If that's a thing. Please also refer to exhibits 5 and 6. When I cleaned off my nightstand earlier this week, I brushed a rather thick coat of dust off my bottle of vitamins. But the wine glass? Not a speck. Take that #7. Then again, I think everything I suffer from can be summed up in one word: MOTHERHOOD.